Oats Feast - Event Announcement!!! Thank you all for your Entries to my Say Cheese Event. Will be posting the roundup soon. I am very happy in hosting my 3rd Event. I have chosen Oats as the main ingredient since its becoming famous and used daily by many of us. Oats are generally considered "healthy", or a health food, being touted commercially as nutritious. The discovery of the healthy cholesterol-lowering properties has led to wider appreciation of oats as human food. We use this in many different forms for cooking. While oats are suitable for human consumption as oatmeal and rolled oats, one of the most common uses is as livestock feed. Oats make up a large part of the diet of horses and are regularly fed to cattle as well. Oats are also used in some brands of dog and chicken feed. Oats have numerous uses in food; most commonly, they are rolled or crushed into oatmeal, or ground into fine oat flour. Oatmeal is chiefly eaten as porridge, but may also be used in a variety of baked goods, such as oatcakes, oatmeal cookies, and oat bread. Oats are also an ingredient in many cold cereals, in particular muesli and granola. Oats may also be consumed raw, and cookies with raw oats are becoming popular. Oat protein is nearly equivalent in quality to soy protein, which has been shown by the World Health Organization to be equal to meat, milk, and egg protein The protein content of the hull-less oat kernel (groat) ranges from 12–24%, the highest among cereals. Oat bran is consumed to lower the bad cholestrol and reduce risk of heart disease. That was a little information on Oats. Hope it was useful. Inviting you all to participate in this event and make it success. 1. Use the logo and the link in your post. 2. 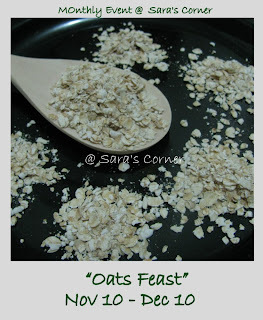 Post a recipe using main ingredient as Oats between Nov 10- Dec 10. It can be any course of food but only vegetarian no eggs please. 3. Email me at simplysara07@gmail.com with Subject Oats and following details. 4. Archived entries should be reposted with the logo and event linked back. 5. Non-bloggers too can participate in this event, send in your recipe by email with a photograph. 7. Round up will be posted in December. Feel free to leave your comment. Hope you enjoy the participation @ Sara's Corner. Looking forward for your support and participation. Hi. This is a very interesting theme. Would love to send something. Interesting theme, will send my entries..
nice event with an interesting theme.will try my best to send entries. Hahaha I'm MADE for this event! Nice theme, happy hosting !